My buddy Dimitri recently had the chance to review Audioengine’s A5 speakers over on WhatsOniPhone. He loved the big sound and excellent build. I’ve recently had a chance to take a look at the far smaller A2s; at about 1/3 the size of the A5s, the A2s are like the smaller sibling and while they don’t pack the SAME punch, they hold their own rather well. Having read Dimitri’s review of the A5s, it was immediately clear that these were an AudioEngine product. The small black cases (they come in white too) are made out of sturdy wood with a hand-polished finish. While the A2s use the same custom tweeters as the A5s, they employ newly designed Kevlar woofers that, like the A5s, are “ungrilled”. The speakers are surprisingly heavy for their size. Placing the A2s next to the LogiTech speakers I have been using with my iMac reinforce just how sleek-looking these small speakers are. From the front the speakers look exactly the same. The back, however, tells a different story as the left speaker is chock full of connectors and the right has… almost none. The A2’s have two flavors of audio inputs– a set of RCA Left and Right jacks and a single 1/8″ mini stereo jack. Typically, you would use the RCA jacks to connect this set to your computer, TV or stereo. A 1/8″ mini jack makes connecting an iPod or other device. All of this makes setup a breeze! The 1/8″ connector is nice but the A2s don’t come with any sort of iPod dock. Fortunately there are a number of choices around but it does mean a small added expense. The bigger issue on this front is the lack of GSM shielding that makes using the speakers with an iPhone a challenge. This, however, is a relatively minor complaint because, when you turn them on, the A2s are very much an AudioEngine product in this department… translation… they sound great. I’m not an audiophile, but I know what sounds good and what doesn’t. The AudioEngine A2s sound GOOD- really good! The highs sound quite nice, and even the lows have a lot of punch. And the volume? The A2s prove that loud things can come in small packages. 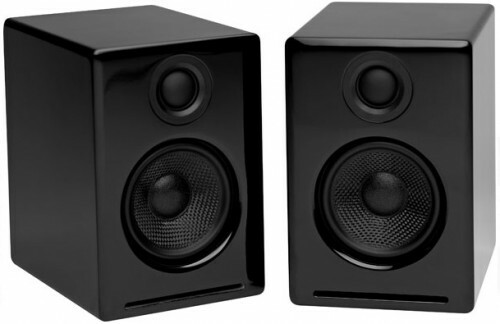 They sound and feel like a much bigger and more expensive set of speakers.